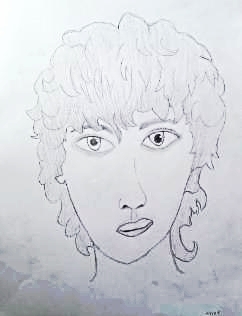 Art Start students learned how to draw the proportions of the face. The first day they drew a boy's face following a step-by-step process. (You can see the worksheet propped on the mirror at left.) Then the second class they drew self-portraits while looking in mirrors- no easy task! Students chose which one they felt was the best drawing from those two classes and that's what I posted below. Next, copying master portraits!